Between The Reader and Revolutionary Road, it’s safe to say that 2008 was been a very good year for Kate Winslet. She won or was nominated for all of the major acting awards for either one of these two films. She also won the big prize that she’s been chasing for some time, the Academy Award. Although she didn’t win it for Road, there were several critics who felt that she should have. Based on Richard Yates’ best-selling novel of the same name, Road attempted to capitalize on popular culture’s recent fascination with retro culture as evident by the success of the television show Mad Men, about New York City advertising executives. There was also a certain amount of anticipation for this film as it was the first time Leonardo DiCaprio and Winslet were reunited on-screen since Titanic (1997). Set in 1950s suburban Connecticut, Revolutionary Road examines dysfunction lurking under the picture perfect, all-American facade of the Wheeler family. Frank (DiCaprio) and April (Winslet) have only been married a few years and have two children but the cracks are already starting to show. Their lives haven’t exactly turned out as they had dreamed: he works a boring 9-to-5 office job while she’s trapped in suburbia as a housewife. Frank and April are both very unhappy with their respective lots in life but they are locked into them because it is what society expects. They are supposed to be happy, after all they’re living the American Dream with two children and a nice house in an affluent suburb – so, why has the spark gone out of their marriage? Ever since he started making films with Martin Scorsese, Leonardo DiCaprio has really matured as an actor and only seems to improve with every subsequent film he does. 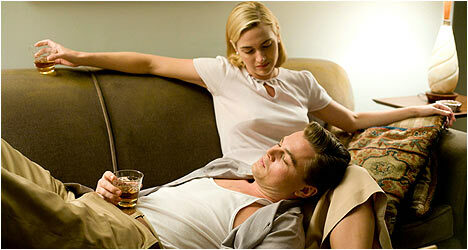 Revolutionary Road is quite possibly his best performance to date. There is a scene, a flashback where Frank reveals his ambitions to April while they are courting. He says, almost wistfully at one point, “I wanna feel things. Really feel them, you know?” The scene is brief but very important because it provides fascinating insight into his character. Before Frank followed in his father’s footsteps, he dreamed of going to Paris where “People are really alive.” DiCaprio also displays the subtle nuances of his character in a scene where April and his two children surprise him after work with a birthday cake. On his face is a shamefully sad expression because, unbeknownst to his family, he has spent most of the day with another woman. Of course, they interpret his tears as that of joy but we know better. DiCaprio still has dynamite chemistry with Winslet as evident in the scene where April proposes that they sell their house, he quit his job, and they use their savings to move to Paris like they dreamed of years ago. At first, it seems like an unrealistic proposition but her passionate reasoning, delivered with heartfelt conviction by Winslet, wins him (and us) over. She does an excellent job conveying someone who wants something more out of life and the impressive part of Winslet’s performance is how she conveys the arc of her character, how April gets more desperate and fed-up with her life with Frank. Winslet is not afraid to expose the raw emotional core of her character and this fearlessness is exciting to watch. She is also absolutely heartbreaking as a woman who feels trapped by the life she’s living. April doesn’t like what she and Frank have become. Almost halfway through Revolutionary Road, Michael Shannon makes a show-stopping appearance as the son of the woman (Bates) who sold the Wheelers their home. His character went crazy and was subjected to electroshock therapy and now he’s a bundle of twitchy nerves but also seems to be the only person who understands why Frank and April want to drop everything and go to Paris. He also seems to be the only person who publicly acknowledges the problems between them. Shannon’s appearance gives the film a refreshing jolt of energy and lightens things up at just the right moments. Sam Mendes also directed American Beauty (1999) and in some respects April is the female version of its protagonist Lester Burnham (Kevin Spacey). Both are tired of their humdrum, predictably existence and desperately need some sort of change in their lives. However, both protagonists are products of their times: American Beauty is set in contemporary times while Revolutionary Road takes place in the ‘50s. Mendes shows how attitudes of society back then contribute to April’s sense of hopelessness. One of the hallmarks of Mendes’ films is the meticulous framing of scenes and the incredible attention to detail in terms of production design. This sometimes threatens to overwhelm the characters in his films. With Road, he wisely realizes that this is a character-driven piece and lets the talented cast do their thing. The result is some incredibly strong performances from his talented cast. This film really belongs to DiCaprio and Winslet and the way they bring their characters so vividly to life. Frank and April aren’t really likable characters per se but the two actors do their best to humanize them to a certain degree. Revolutionary Road depicts, with unflinching clarity, the reality of a married couple’s life versus the hopes and dreams they once had and how they reconcile the differences between the two. There is an audio commentary by director Sam Mendes and screenwriter Justin Haythe. According to Mendes, the BBC owned the rights to Yates’ book and asked Haythe to adapt it four years ago. They shot the entire film on location and almost completely in sequence so that DiCaprio and Winslet really lived with their characters. Mendes says that the look of the film was not inspired by other films but a documentary about the suburbs and photographs from the era. Haythe talks at length about adapting the book to film – what was left out, changed and so on. “Lives of Quiet Desperation: The Making of Revolutionary Road” is a very classy featurette on how this film came together. Winslet was a big fan of the book and really wanted to make it into a film. Mendes had just finished Jarhead (2005) and didn’t want to jump right into another film but Winslet worked on him for a year until he agreed to do it. It also took Winslet two years to convince DiCaprio to do the film and he loved the script and the chance to work with her again. This featurette also touches upon the challenge of working on location and how the fantastic look of the film was achieved. Finally, there are five deleted scenes with optional commentary by Mendes and Haythe. There is a scene that was to reveal the Wheeler children earlier on in the film. There is also more footage of the Wheelers visiting with their next-door neighbours with DiCaprio delivering an excellent monologue that reveals more about his character. We see more footage of Frank commuting to work. There is also a flashback with the Wheelers seeing their new home. Mendes and Haythe talk about why this footage was cut and put it into context with the rest of the film.